Prime Minister Sheikh Hasina yesterday said her government was highly committed to ensuring compliance with regard to the readymade garment (RMG) industry. “The contribution of the apparel and textile industry to our economy is immense. We are highly committed to ensure compliance with regard to labour rights, workplace safety and environmental standard in the industry,” she said. The PM was replying to questions at a workshop titled “Shaping a New Water Economy” at the 47th Annual Meeting of the World Economic Forum at Congress Centre here. Hasina said Bangladesh’s RMG industry achieved higher compliance standards in terms of wages, workplace safety, norms, practices and harmonious industrial relations. “There has been a 77 percent increase in basic wage. Assessment of all the 3,780 factories as recommended by global brands and retailers has been completed,” she added. Andrew Steer, president and CEO of World Research Institute, moderated the workshop attended by heads of state and government of different countries. The PM said Bangladesh is the second largest apparel and textile exporting country in the world. The sector employs 4.5 million workers, of which 80 percent are women. The industry accounts for 83 percent of the country’s total exports. “We are supporting the industry to ‘go green’. Today, Bangladesh has 38 LEED certified factories. Out of the world’s top 10 green factories, seven are in Bangladesh,” she pointed out. The premier said since 2015, the Bangladesh government has been working with 2030 Water Resources Group (WRG) to achieve 100 percent wastewater treatment and increase water use efficiency as per international benchmarks in the country’s apparel sector. World leaders, including Sheikh Hasina, gathered in Davos as the 47th Annual Meeting of the WEF kicked off yesterday. The four-day meeting began at Congress Centre in Davos under the theme “Responsive and Responsible Leadership”. President Xi Jinping of China opened the proceedings of the meeting. Hasina along with other heads of government and state joined the opening plenary and other events of the meeting. Heads of state and government of 45 countries joined the meeting which began with a welcome address by WEF founder Klaus Schwab and felicitation of celebrity singer Shakira, among others, for her work towards promoting education. On the sidelines of the forum, Hasina had informal interaction with the Chinese and Swiss presidents yesterday. The WEF is a Swiss non-profit foundation, based in Cologne, Geneva. Its mission is cited as “committed to improving the state of the world by engaging business, political, academic and other leaders of society to shape global, regional and industry agendas”. 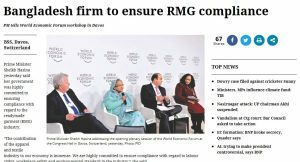 DAVOS (Switzerland), Jan 17 (BSS): Prime Minister Sheikh Hasina said on Tuesday her government was highly committed to ensuring compliance in the readymade garment (RMG) sector, reports BSS. “The contribution of apparel and textile industry to our economy is immense. We are highly committed to ensure compliance with regard to labour rights, workplace safety and environmental standard in the industry,” she said. The premier also said Bangladesh’s readymade garment sector achieved higher compliance standards in terms of wages, workplace safety, norms, practices and harmonious industrial relations. “There has been a 77% increase in basic wage. Assessment of all the 3780 factories as recommended by global brands and retailers has been completed,” she said. The Prime Minister was replying to questions at the workshop on “Shaping a New Water Economy” in the 47th Annual Meeting of the World Economic Forum at Congress Centre here. President and CEO of World Research Institute Andrew Steer moderated the workshop attended by heads of state and government of different countries participating in the WEF. Sheikh Hasina said Bangladesh is the second largest apparel and textile exporting country in the world. “The sector employs 4.5 million workers, of which 80 per cent are women. The industry accounts for 83% of our total exports,” she said. The premier said the factories were now working hand-in-hand with global brands and retailers to ensure international standards. Every factory had an Occupational Safety Committee where employers and workers were working together, she said. Increasing private sector and civil society participation in water governance. As a member of the High-Level Panel on Water, she said, she was committed to innovating frameworks like 2030 WRG. UNB adds, earlier the Prime Minister along with other global leaders gathered here on Tuesday as the 47th Annual Meeting of the World Economic Forum (WEF) began. Prime Minister Sheikh Hasina joined the opening plenary and other events of the meeting along with other heads of government and state. 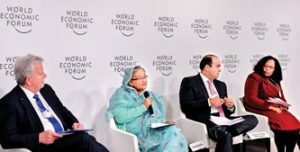 Before the opening plenary of the World Economic Forum, WEF Executive Chairman Prof Klaus Schwann called on Sheikh Hasina. The 2030 Water Resources Group is a platform where public, private, multilateral, and nongovernmental-organization actors collaborate and work toward identifying solutions that increase water sustainability and efficiency. The secretariat of the 2030 Water Resources Group is currently being hosted by the IFC at its Headquarters in Washington D.C. 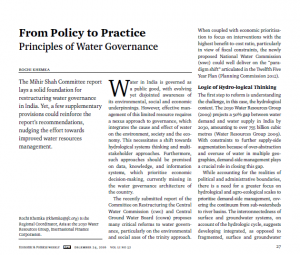 The Mihir Shah Committee report lays a solid foundation for restructuring water governance in India. Yet, a few supplementary provisions could reinforce the report’s recommendations, nudging the effort towards improved water resources management. Water in India is governed as a public good, with evolving yet disjointed awareness of its environmental, social and economic underpinnings. However, effective management of this limited resource requires a nexus approach to governance, which integrates the cause and effect of water on the environment, society and the economy. This necessitates a shift towards hydrological systems thinking and multi-stakeholder approaches. Furthermore, such approaches should be premised on data, knowledge, and information systems, which prioritize economic decision-making, currently missing in the water governance architecture of the country. The recently submitted report of the Committee on Restructuring the Central Water Commission (CWC) and Central Ground Water Board (CGWB) proposes many critical reforms to water governance, particularly on the environmental and social axes of the trinity approach. When coupled with economic prioritization to focus on interventions with the highest benefit-to-cost ratio, particularly in view of fiscal constraints, the newly proposed National Water Commission (NWC) could well deliver on the “paradigm shift” articulated in the Twelfth Five Year Plan (Planning Commission 2012). The first step to reform is understanding the challenge, in this case, the hydrological context. The 2030 Water Resources Group (2009) projects a 50% gap between water demand and water supply in India by 2030, amounting to over 755 billion cubic meters (Water Resources Group 2009). With constraints to further supply-side augmentation because of over-abstraction and overuse of water in multiple geographies, demand-side management plays a crucial role in closing this gap. While accounting for the realities of political and administrative boundaries, there is a need for a greater focus on hydrological and agro-ecological scales to prioritize demand-side management, covering the continuum from sub-watersheds to river basins. The interconnectedness of surface and groundwater systems, on account of the hydrologic cycle, suggests developing integrated, as opposed to fragmented, surface and groundwater emphases. With detailed hydrological mapping, sufficient granularity may be established to cover the aggregation and disaggregation of scales from village-level micro-watersheds to multistate river basins. In other words, the starting point of water governance is a better understanding of water itself. The hydrological lens of water governance can develop into an operational system when supplemented with the tools of scientific data and analysis. Equipped with these systems, relevant stakeholders can undertake actions needed to counter water scarcity and pollution. Nonetheless, data availability in India is currently fragmented, scattered across multiple agencies, and inadequate for sound decision-making. Moreover, data gaps exist, in particular, on the interconnectivity of rainwater, surface water, and groundwater, land use, environmental flows, ecosystems, socio-economic parameters, and demographics at the watershed level. Where available, the data is often not accessible. To foster coordinated action for better demand-side management, ease of data access by all stakeholders is vital, covering real-time data sets, remote sensing technologies, and geographic information systems (GIS), in addition to historical data and projections on water availability and quality. Over and above raw data availability, data points require analysis to feed into information systems, which in turn foster knowledge systems for action at scale. The linkages between data, information, and knowledge systems, encapsulated in user-friendly interfaces, can form the basis for the development of response strategies. Data transparency lends itself to collaborative approaches, as also good governance. Governance structures uphold not only transparent mechanisms, but also inclusiveness, equity and accountability. In view of multiple stakeholders influencing and affected by water flows, spanning farmers, urban communities, industry and government, any governance framework ought to supplement government structures with inclusive and transparent stakeholder processes for joint decision-making to achieve intended objectives. Thus, hydrological mapping and data sharing should be complemented with the establishment of stakeholder councils, and with balanced participation across stakeholder groups. Such councils offer a mechanism for protection of water resources by resolving conflicts between stakeholder groups, and developing a shared vision for the use of water resources to support economic growth, social development and environmental protection. Participatory approaches may be initiated for each river basin at a minimum, ideally with higher coverage for bigger river basins along key tributaries. The Committee on Restructuring CWC and CGWB’s report suggests some essential reforms in the water governance framework of the country. Calling for participatory water governance, including aquifer-based approaches, the report rightly centers the restructuring on hydrological lines, proposing that the twin entities be transformed into a new NWC, covering both groundwater and surface water issues. The NWC’s suggested multidisciplinary approach provides much-needed focus on water challenges outside those currently analyzed by the CWC and CGWB, but which have important implications for water sustainability, such as water quality, urban and industrial water management, and river basin management, among others. It is only through a unified, cross-sectoral approach that aquifer-based governance can offer successful mechanisms for countering groundwater depletion, and for maintaining surface water flows, and water quality. The proposal to establish a knowledge network to guide the NWC’s activities says the necessary apparatus must bring in thought leaders from relevant global and national organizations. This, combined with an ongoing capacity building initiative, promises to mainstream innovation in the DNA of the NWC. Additionally, the recommendation for data-driven approaches lies at the core of participatory governance, whereby stakeholders are provided the scientific ammunition to assess local water issues for informed decision-making. While the report lays a solid foundation for restructuring water governance in India, which merit inclusion by the government, a few supplementary pillars can reinforce the recommendations to shift the proverbial needle towards improved water resources management, as outlined below. A primary step in this direction is the development of watershed vision documents, which highlight key goals for each watershed, prioritizing socio-economic development alongside ecological protection, which is often overlooked in water resources planning. For meaningful transformation, watersheds could be defined at the tributary scale for large river basins, such as the Ramganga and Hindon, or at a minimum of 1,00,000 hectares to promote strategic solutions thinking. In addition to inputs from the NWC, the development of such watershed visions could crowdsource information from stakeholder councils or platforms, supported by NwC. Stakeholder involvement from the start simplifies the alignment of interests and initiation of actions. Another important pillar of water governance relates to ensuring economically sound and cost-effective solutions. Hydro-economic analysis integrates the costs, benefits, and risks of various solutions, aimed at enhancing the economic productivity of water. Such analyses provide a common language for decision-makers to choose between policy choices and competing investments. For example, 80% of the projected water gap in 2030 can be closed by low-cost agricultural measures, including no-till farming, crop protection technologies, and reducing over-irrigation, among others. These measures obviate the need for expensive, supply-side interventions, such as the construction of dams, interlinking of rivers, and lift irrigation schemes, providing a net surplus both hydrologically and fiscally. Hydro-economics is most effective in the analysis of opportunity costs. Circular economy solutions, such as recycling and reuse of water, emerge as favored solutions over freshwater abstraction, when economic feasibility is incorporated into hydrological assessments. In particular, integrated decision-making allows for an analysis of synergies and trade-offs between water, agriculture, energy, environment and livelihoods. Accounting for this nexus ensures the economy adopts a sustainable development pathway—socially, economically, and environmentally. Technological improvements for water use efficiency and waste water management may serve as vehicles to accelerate economically effective transformation. Governance reform needs to keep pace with technological advancements in agricultural, urban, and industrial water management. The NWC should institute an research and development (R&D) wing, which promotes technology acceleration across sectors in partnership with universities and research organizations. This wing could also work towards necessary financing solutions to promote technology use, mobilizing financial markets funds to supplement government subsidies where a business case for such funding exists. This would be particularly relevant in agriculture, where technology use leads to higher incomes through productivity increase, driving economic growth with water efficiency. A related aspect links to agricultural market linkages, whereby partnerships with agribusiness companies are established to mitigate growing supply chain risks and reduce the indirect water footprint of agribusiness companies. Public-private-community partnerships are the cornerstone of programs such as Public Private Partnerships for Integrated Agricultural/Horticultural Development (PPP-IAD/PPP-IHD), promoted by the governments of Maharashtra, Karnataka, and Andhra Pradesh, among others. Such partnership models provide economic benefits to farmers and supply chain actors, and ensure sustainability of interventions, including effective utilization of the irrigation infrastructure created. In addition to collaboration across communities and agribusiness companies, partnerships such as these demand cross-departmental government coordination, with the involvement of entities to do with water resources, agriculture, horticulture, rural development, and finance, among others. Early alignment with other departments will integrate the water dimension within agricultural demand-side management, with better upstream linkages to irrigation infrastructure and downstream linkages to markets, providing income enhancement opportunities for farmers. Considering 80% of freshwater is used for agricultural purposes in India, there is a need for systems thinking in the sector for water-efficient growth. Urban water management suffers from inadequate infrastructure. A staggering 78% of waste water is estimated to be untreated nationally (Center for Science and Environment 2016). Where such infrastructure exists, there is poor operations and maintenance, negating the effect of millions of rupees spent on infrastructure creation. The proposed NWC Urban and Industrial Water Division could serve as an incubation cell for business models and revenue-generating opportunities, particularly for waste water treatment and reuse, evaluating the financial viability of reuse, proximity of reuse from the point of treatment, as also closed loop models, thereby promoting energy efficiency and nutrient recovery. With the articulation of policy reform and institutional mechanisms, the crucial next step is supporting the implementation of solutions at scale. Effective implementation requires a combination of, first, behavior change by millions of individual households and farmers, as also industrial players, through decentralized solutions, and second, catalysts to enable such change. The differentiating factor of catalysts is their transformative agenda, vision, and neutrality. Such development partners are a category distinct from non-governmental organizations (NGOs), and often support partnerships across multiple community organizations to implement solutions. The NWC’s partnerships framework would benefit from including international and national catalysts to facilitate scalable solutions. Effective implementation equally warrants a dedicated financial institution to support large-scale demand-side management and innovative financing—a “National Bank for Water Management,” a National Bank for Agriculture and Rural Development (NABARD)-equivalent entity, exclusively mandated to support solutions for water sector transformation. The NWC proposal could brainstorm the creation of such an institution to prioritize water sector financing. The World Economic Forum’s Global Risk Report (2016) lists failure of climate change mitigation and adaptation as the most significant risk by impact. The effects of climate change are increasingly recognized through its associated risks of financial, material, and ecological losses. A seminal World Bank report highlights the centrality of water to climate challenge, arguing that, “Achieving nearly every one of the SDGs [sustainable development goals] is dependent on solving the water problem” (World Bank 2016). Ignoring climate challenge can undermine water sector investments and existing capacities. Addressing the challenge, on the other hand, requires a multi-pronged approach, which goes beyond forecasting climate change events to preparing the agrarian, urban, and industrial economies, as well as ecological functions, to respond to such events. It is estimated that 65% of projected climate change losses may be averted through cost-effective adaptation investments (ECA 2009). In light of these issues, the NWC’s proposed Water Security Division would benefit from an expansion in role to cover Climate Adaptation. Commencing with vulnerability assessments and scenario modelling, the division’s responsibilities require surpassing such initial analyses to cover the design of effective policies and incentives for long-term climate change-oriented actions, channelization of capital flows to climate-resilient infrastructure, and formulation of appropriate responses to climate events. Although response strategies usually lean towards built or grey infrastructure, there is a growing body of work that highlights the benefits of nature-based solutions, providing ecosystem services along with safeguarding environmental systems. The above arsenal of information and knowledge systems, including climate adaptation tools, together with effective communications instruments, offer the dual advantage of prioritizing action, while providing a framework for monitoring and evaluation (M&E) through standardized metrics. Water governance, thus warrants ongoing M&E for assessing the success of interventions and undertaking corrective measures in case of shortfalls. A gradual move from outputs or rupee-based monitoring towards cubic meters- and impacts-based monitoring is indispensable for the effective design of solutions. The alignment of science, stakeholders, and economics for governing a country’s water resources is a continuous process. A successful governance blueprint is one that provides the right foundation, along with the flexibility to adapt to changing priorities. This requires a delicate balance of combining top-down policy with bottom-up practice, institutional structures with stakeholder processes, and robust planning with course correction. Navigating the arc from vision to action starts with recognizing the need for change. And this is where the proposed restructuring of water governance in India provides a welcome opening. Center for Science and Environment (2016): Down to Earth. Planning Commission (2012): “Faster, More Inclusive and Sustainable Growth,” Vol 1, Twelfth Five Year Plan; http://planningcommission.nic.in/plans/planrel/12thplan/welcome.html. Water Resources Group (2009): Charting Our Water Future, 2030. The annual 2030 Water Resources Group (2030 WRG) Tanzania Partnership meeting, held last week, closed with calls for increased partnership and innovative financing to propel Tanzania’s water-smart future. Sponsored by the Ministry of Water and Irrigation and supported by the 2030 Water Resources Group Tanzania Partnership, the meeting convened over 100 stakeholders from the public sector, private sector and civil society to discuss ways to collectively strengthen water resource management throughout the country. 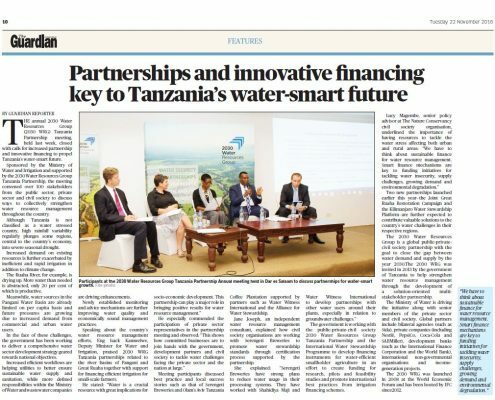 Dar es Salaam, 22 November 2016 — The annual 2030 WRG Tanzania Partnership meeting, held last week, closed with calls for increased partnership and innovative financing to propel Tanzania’s water-smart future. 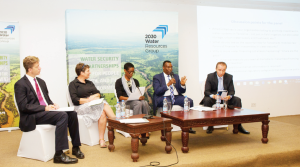 Sponsored by the Ministry of Water and Irrigation and supported by the 2030 WRG Tanzania Partnership, the meeting convened over 100 stakeholders from the public sector, private sector and civil society to discuss ways to collectively strengthen water resource management throughout the country. Although Tanzania is not classified as a water stressed country, high rainfall variability regularly plunges some regions, central to the country’s economy, into severe seasonal drought. Increased demand on existing resources is further exacerbated by inefficient and rapid irrigation in addition to climate change. The Ruaha River, for example, is drying up. More water than needed is abstracted, only 20 per cent of which is productive. 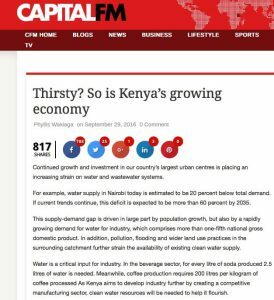 Meanwhile, water sources in the Pangani Water Basin are already limited on per capita basis and future pressures are growing due to increased demand from commercial and urban water users. In the face of these challenges, the government has been working to deliver a comprehensive water sector development strategy geared towards national objectives. Increased efficient workflows are helping utilities to better ensure sustainable water supply and sanitation, while more defined responsibilities within the Ministry of Water and waste water companies are driving enhancements. Newly established monitoring and advice mechanisms are further improving water quality and economically sound management practices. He especially commended the participation of private sector representatives in the partnership meeting and observed: “This shows how committed businesses are to join hands with the government, development partners and civil society to tackle water challenges facing the private sector and the nation at large.” Meeting participants discussed best practice and local success stories such as that of Serengeti Breweries and Olam’s Aviv Tanzania Coffee Plantation supported by partners such as Water Witness International and the Alliance for Water Stewardship. The government is working with the public-private-civil society 2030 Water Resources Group Tanzania Partnership and the International Water Stewardship Programme to develop financing instruments for water-efficient smallholder agriculture in an effort to create funding for research, pilots and feasibility studies and promote international best practices from irrigation financing schemes. Two new partnerships launched earlier this year—the Joint Great Ruaha Restoration Campaign and The Kilimanjaro Water Stewardship Platform—are further expected to contribute valuable solutions to the country’s water challenges in their respective regions. The 2030 Water Resources Group is a global public-privatecivil society partnership with the goal to close the gap between water demand and supply by the year 2030.The 2030 WRG was invited in 2013 by the government of Tanzania to help strengthen water resource management through the development of a solution-oriented multistakeholder partnership. The Ministry of Water is driving the initiative along with senior members of the private sector and civil society. 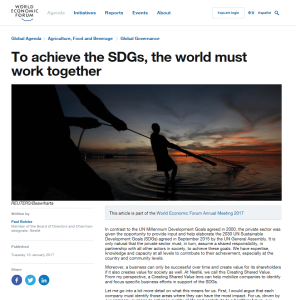 Global partners include bilateral agencies (such as Sida), private companies (including Nestlé, PepsiCo, Coca-Cola and SABMiller), development banks (such as the International Finance Corporation and the World Bank), international non-governmental organisations and income generation projects. The 2030 WRG was launched in 2008 at the World Economic Forum and has been hosted by IFC since 2012. Continued growth and investment in our country’s largest urban centres is placing an increasing strain on water and wastewater systems. For example, water supply in Nairobi today is estimated to be 20 percent below total demand. If current trends continue, this deficit is expected to be more than 60 percent by 2035. This supply-demand gap is driven in large part by population growth, but also by a rapidly growing demand for water for industry, which comprises more than one-fifth national gross domestic product. In addition, pollution, flooding and wider land use practices in the surrounding catchment further strain the availability of existing clean water supply. Water is a critical input for industry. In the beverage sector, for every litre of soda produced 2.5 litres of water is needed. Meanwhile, coffee production requires 200 litres per kilogram of coffee processed. As Kenya aims to develop industry further by creating a competitive manufacturing sector, clean water resources will be needed to help it flourish. Companies across the world are realising that incorporating sustainable solutions into their business plans is not only socially responsible, but could also have financial benefits. By addressing environmental and social issues companies can achieve better growth and cost savings; improve their brand and reputation; strengthen stakeholder relations, and boost their bottom lines. 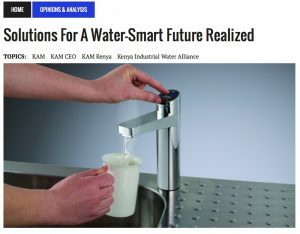 Motivated by the aforementioned realities, local public, private and civil society organizations are joining forces in a new partnership-the Kenya Industrial Water Alliance (KIWA). Audits, for example, have shown that Kenyan manufacturers have an opportunity to reduce water use by 20 to 30 percent on average through cost-effective interventions. We are carrying this out at subsidized rates and we have done ten pilot audits so far in the manufacturing sector. The writer is CEO of Kenya Association of Manufacturers (KAM) and also chair of the Kenya Industrial Water Alliance (KIWA). Continued growth and investment in our country’s largest urban centers is placing an increasing strain on water and wastewater systems. For example, water supply in Nairobi today is estimated to be 20 percent below total demand. If current trends continue, this deficit is expected to be more than 60 percent by 2035. This supply-demand gap is driven in large part by population growth, but also by a rapidly growing demand for water for industry, which comprises more than one-fifth national gross domestic product. In addition, pollution, flooding and wider land use practices in the surrounding catchment further strain the availability of existing clean water supply. This supply-demand gap is driven in large part by population growth, but also by a rapidly growing demand for water for industry, which comprises more than one-fifth national gross domestic product. In addition, pollution, flooding and wider land use practices in the surrounding catchment further strain the availability of existing clean water supply. Companies across the world are realising that incorporating sustainable solutions into their business plans is not only socially responsible, but could also have financial benefits. By addressing environmental and social issues companies can achieve better growth and cost savings; improve their brand and reputation; strengthen stakeholder relations, and boost their bottom lines. 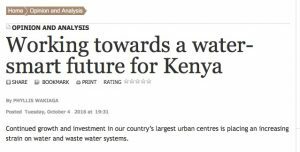 Motivated by the aforementioned realities, local public, private and civil society organizations are joining forces in a new partnership-the Kenya Industrial Water Alliance, also known as KIWA. Initiatives like this provide hope for urban communities who in the past have suffered due to pollution associated with industrial expansion. These grievances are felt at home and across the globe, China’s largest cities, for example, have seen increases in air pollution, contaminated drinking water, water shortages, marine pollution, and deforestation. Meanwhile, addressing supply and pollution challenges is costing the Bangladeshi capital of Dhaka US $700 million per year as the country as a whole has assumed an estimated annual US $7 billion in economic losses from unimproved water and sanitation.